It’s middle of winter and I’m wearing shorts ♥ Seriously I just died of happiness when Phil ( my hubby) found this leather jacket at Nordstrom Rack during our Christmas vacation back in Washington about a month or so ago. Not because I especially wanted a light brown leather jacket or anyhting, but because it is so incredibly SOFT! I had fun wearing this look! Paired with my favorite short lace I’d nearly be ready for a night on the town. Hope you had a great week so far. Thanks for stopping by! I love how you have put this outfit together. love a good lace-bottom short, and the biker jacket adds just the right amount of tough-girl to the ensemble. beautiful! you look gorgeous! 🙂 your style – the look and your make-up are awesome! 🙂 and the connection between your shirth and the jacket with your skirt – stunning! Such a cute look! Love the lace! You look so pretty in a such delicious pink colour outfit ! I LOVE your style. This outfit is AWESOME- your jacket is perfection!! Omg you always look so stunning and love how you styled it bb! love your style as always! Always so colorful and lovely! ? I love the bright pops of colour it looks really great on you! your hot pink clutch is so cute! darling summer look! Have a great start to the week hunny! I am loving those shorts! They are adorable!! Pink perfection! I love all of the pops of color and the touch of lace! This look is positively stunning!! I especially love that hot pink clutch! love the combo <3 gorgeous pumps and cool jacket! lace makes every outfit more feminine…….this combo is outstanding! Plus, you have a beautiful smile!!!!!!!!!!!! You are so gorgeous in this look! I love the mixture of textures and prints, so chic and I love me some lace too. Wow, love the lipstick! And the outfit is beautiful.. love lace! I’m really in love with Lace at the moment as it’s so beautiful and stylish. Really like the way you have styled this outfit. Beautiful. I love the wonderful gem called Nordstrom rack! Love the love and of course that jacket! gorgeous outfit and photos! 🙂 Happy Holidays dear! I love Pink on you Babe!!!! You are so gorgeous and lovely…. You look amazing my gorgeous friend and I am loving these feminine shorts on you! I can see why you got excited about this moto jacket because it’s fabulous! Such a stunning look babe!! I love the shoes! Looking as beautiful as always, you’re such a stunning woman! Also love the look from head to toe, such lovely colours. Can’t get enough of all the beaut warm tones in this outfit. Making this bleak day seem a little brighter! You look fab!!! Look fantastic girl! So happy to have connected and help inspire one another. Loving the brightness of those shorts and clutch! Loved your shorts very much! They look cool. Have a great day. You look so gorgeous on that outfit! You looks so gorgeous!! Love your lips dear!! Pretty outfit! Cannot believe you are a mom. You look amazing!!! Good going, Len! How fun hun! 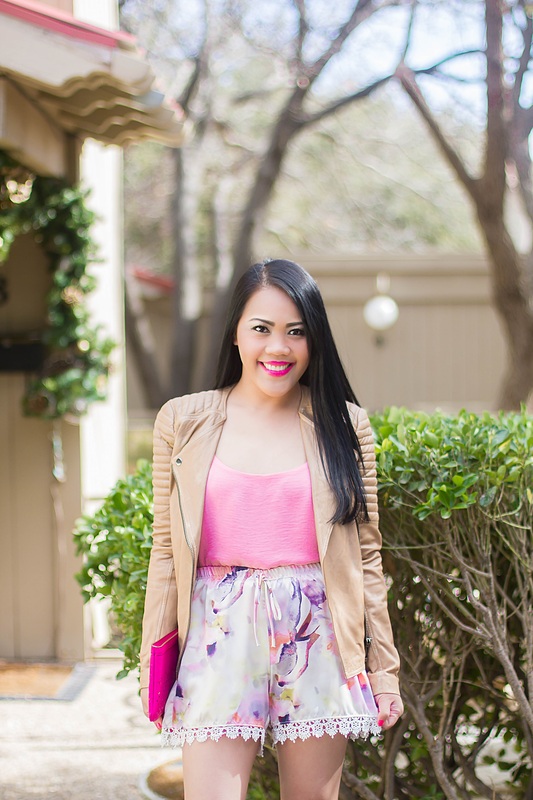 I love the pops of bright pink and the leather jacket is SO cute. this is such a pretty look. i love how you had different shades of pink /fuschia mixed such, such a bold and feminine look. love it! You look gorgeous in everything! Loving that clutch! Always looking so gorgeos!! Love those shorts and the shoessss!!!! Not to mention that cute clutch!!! You rock babe! Pretty and romantic look with I love this bag! Love this cute look! You have great taste in clothes! Beautiful pictures, and your accessories are so cool. Those shorts are super cute 🙂 You look fantastic! OMG! In love with the printed short shorts and love how u wore it with jacket and matching shoe and bag! such a beautiful lipstick!! Looks so nice on you! That leather jacket is just perfect on you! Perfect for all seasons! Hey! I must say your husband has a great choice, I love the leather jacket! Love how u wore it with printed shorts and pink bag! I would love if you checkout my blog! so cute! I really love this color palette! Love this leather jacket! Such a perfect color!